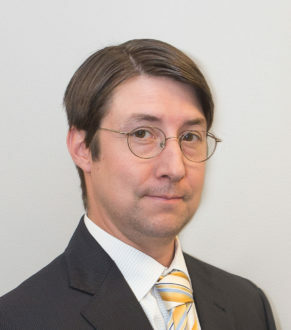 Matthew T. Merryman joined The Justis Law Firm LLC in 2016. Matthew was born and raised in the Greater Kansas City area and is proud to hail from the pragmatic Midwest. A graduate from the University of Missouri-Kansas City, Matthew earned a double Bachelors of Arts in Philosophy and English before pursuing his law degree at the Lewis & Clark Law School in Portland, Oregon. Prior to law school, Matthew worked for two years with the Boy Scouts of America’s Southeast Louisiana Counsel as a District Executive in Post-Katrina New Orleans helping to rebuild the youth programs for the region. During law school, Matthew served as a staff member and submissions editor for the Animal Law Review, which at the time was the only such law review in the country to specifically cover animal law issues. In addition, Matthew clerked with the National Crime Victims Law Institute, the Jackson County Prosecutors Office, the Federal Public Defenders Office for the W.D. of Missouri, and the Missouri State Public Defenders Office. In 2013, Matthew earned his J.D. from Lewis & Clark. He began his legal practice as an Assistant Public Defender for the State of Missouri, where he worked for two years as a trial attorney before joining the Justis Law Firm. As a Public Defender, Matthew handled over one thousand criminal cases while gaining valuable negotiation and litigation skills through his practice. Matthew is a strong believer in public service and continues to serve the community as the Chair for the Midwest Innocence Project Next Gen Board and as a reading buddy at Operation Breakthrough for Lawyers Encouraging Academic Performance. Matthew is licensed to practice in the state of Missouri and the federal district court for the Western District of Missouri. Matthew’s professional affiliations include The Missouri Bar, the Kansas City Metropolitan Bar Association, and the Association of Women’s Lawyers. Matthew is a diehard Royals fan, ardent road tripper, and amateur folk artist.